Captain Joey Bud Russo, Ritchie Beiber, and Steven Siegfried were out for a wonderful day of fishing aboard the party boat Capt Mike with Capt. Mike Cannon. They had a fabulous day limiting out on blackfish up to 7 pounds with a few large sea bass mixed in as well. 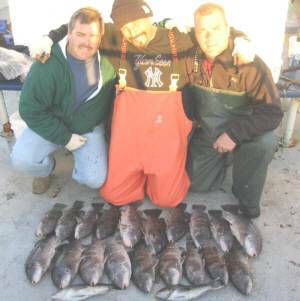 They were fishing with green crabs in 60 feet of water off of Sandy Hook. Blackfish can be found from Nova Scotia, Canada to South Carolina. They live along the coast in rocky areas and may be found near pilings, jetties and wrecks. Blackfish are commonly taken at fishing reefs in the Atlantic Ocean just south of Long Island. Usually anglers catch fish from 1.5 to 3 pounds. Blackfish will feed on crabs, clams and worms as bait. 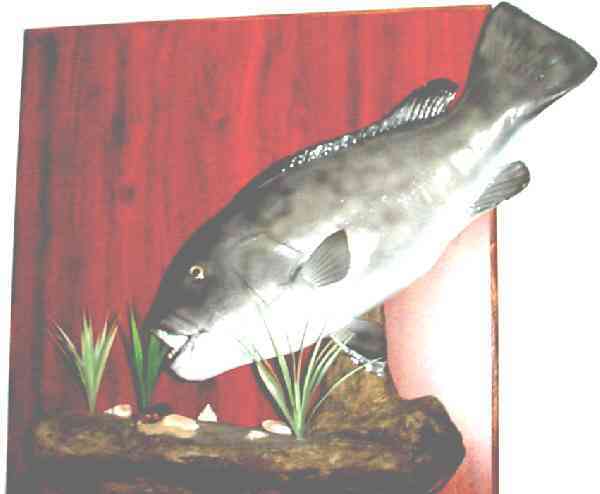 Blackfish are also know as Tautog. The state record Blackfish weighed an incredible 19 pounds and 12 ounces. This awesome fish was caught by Jim Burgon from Riverhead, NY on 08/22/92 Fishing season on Blackfish is from October 1 through May 31. Up to 10 fish per day may be taken. The size limit is 14 inches. Saltwater Regulations can change quickly so keep up to date and check the Salwater Fishing Regulations before every outing so as to be aware of any sudden changes. 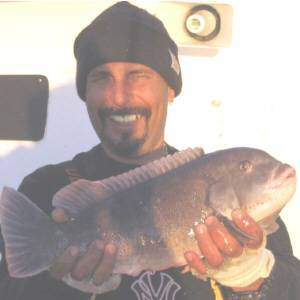 Here is a trophy Blackfish also known as Tautog, it was caught by Capt. Joe Russo on December 20, 2003. This fantastic fish weighed in at 11 pounds and 4 ounces. It was caught on a Jonah Crab on a snafu rig on the bottom in a 100 foot of water off the New Jersey Highlands. Although blackfish may reach 20 pounds or more the average fish caught is 2 to 4 pounds so anything over 10 pounds would be a trophy fish.